Part 2 of the blog entry of Jun Takano regarding the "Z-DRY" development. Translated from the original Japanese. At the time I had a pretty close relationship with a music promoter who also played guitar and consulted me regarding foreign musicians' guitars and gear more than a few times. Or course, whenever he had problems with equipment of foreign musicians (such as needing emergency repairs) I would always deal with it on an emergency basis so I had come to the point where I had gained his strong trust. So, when I showed him the guitar with the prototype pickups he told me that he wanted to borrow it so he could show it to some foreign musicians. After a few days had passed word came from my friend that he had shown the guitar to Don Felder (Eagles) who really liked the sound and wanted to have one himself. After that we sent out a newly built guitar with a set of pickups installed. We were both pretty happy to have the pickup get some recognition. However, there was still some way to go yet. While it was close to the essence of the sound that I was aiming at, there was still a substantial gap to overcome. On the occasion of the next business trip to Matsumoto I had another meeting with the previously-mentioned Ushimaru-san. 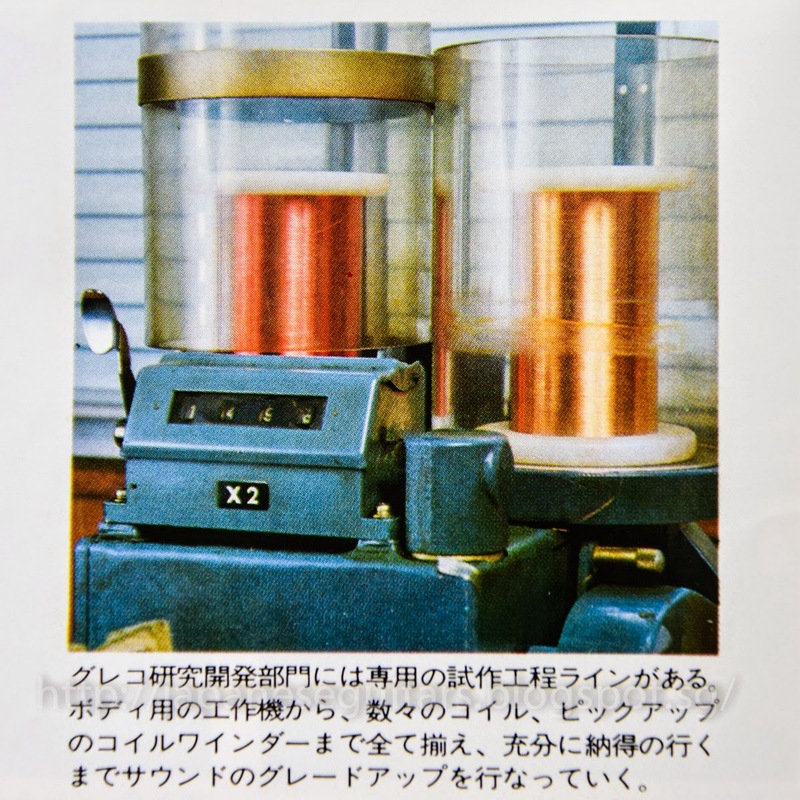 Photo of a winding machine from 1981 Greco Catalog: "The R&D Department; continually developing and building prototypes. 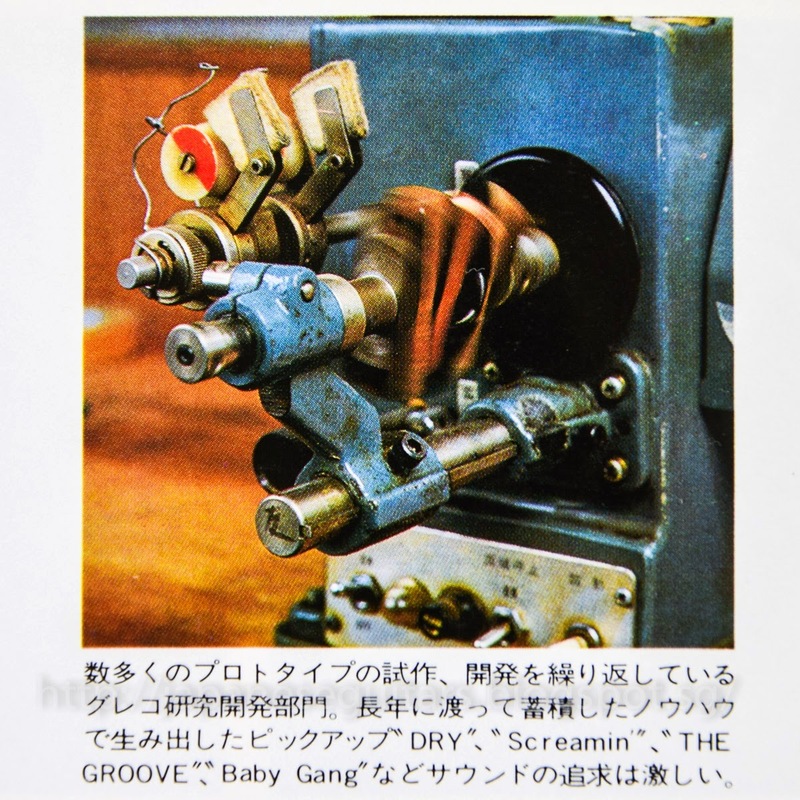 The passionate pursuit of sound using the know-how accumulated over the years has given birth to pickups like "DRY", "Screamin'", "The Groove" and "Baby Gang." Ushimaru-san firmly grasped the sound I wanted and we resolved to change the specifications of the magnet. Around that time I was personally pretty well connected with the music business. There was a very big name in the music business (who everyone probably would still know today) who was a busy producer and studio musician so I passed one of the guitars to him. A few days later he let me know that he was really satisfied with the guitar. At the time he was playing on a prime-time TV show and had ended up using the guitar all the way through the whole show. Another proposal came from Ushimaru-san. Winder picture from the 1981 Greco catalog: "There is a dedicated prototyping production line in the Greco R&D Department. With all the machines needed ranging from those for prototyping bodies to the coil winders for numerous coil and pickup combinations, refinement of sound goes on until it it is completely acceptable." The result came out to be extremely close to what I wanted. Santana ended up trying it out and wanted a set so a few days later I sent them off. Up to that time the pickup had more recognition by foreign musicians than within Fujigen itself and more and more foreign guitarists gave good feedback. At a planning meeting it was decided to put the pickup into production. It was now time to name the pickup as a crystallization of the efforts we had made. I really didn't like the inorganic names like U-3000 and PU-2 that had been used up to that time. Respecting that "the name should demonstrate the voice" it was given the name of "DRY" to most closely match the tone. This was way before Asahi Beer did it mind you!